Just a quick post to announce the winner of The Wellness Show Gift Package and Tickets! We had 31 entries via comments and Twitter, which I just plugged into good ol’ Random.org. Et Voila! 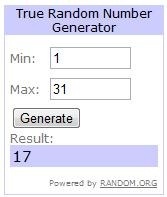 Congrats to #17 – Bonnie! Thanks to all who entered, and hopefully I will see some of you at the show this weekend.